At Uncle Bill’s Pet Center, we not only offer JW dog toys for sale, we also employ a highly trained staff that can assist you in finding the appropriate toy for your dog. The medium Grass Ball is a tough rubber dog toy infused with vanilla extract that is as versatile as it is fun! 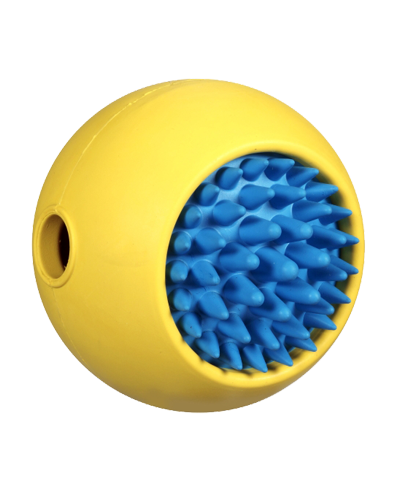 This innovative ball is super durable and double-molded to stand up to tough chewers. The spiked top and bottom makes the Grass Ball a top choice for teeth cleaning, and the smooth sides make it an excellent fetch toy. The openings on each side allow the Grass Ball to be used as a treat ball too! We will be glad to work with you to ensure that your pet enjoys quality toys for optimal health and happiness by providing the best selection and value on premium dog toys for sale in Indiana.